Photo: Montpelier (Laurel, Maryland) was built by Major Thomas Snowden and his wife, Anne ca, 1783. 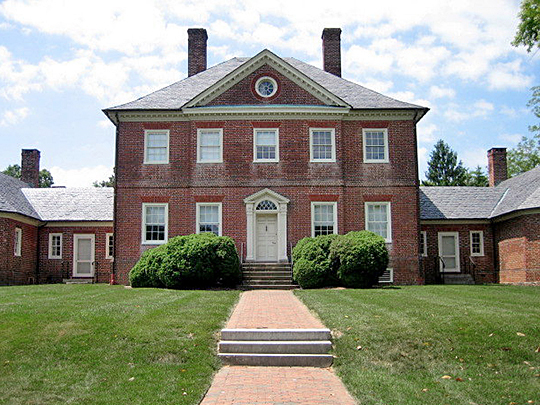 Montpelier Mansion is a National Historic Landmark and was listed on the National Register of Historic Places in 1970. Photographed by User:Quarterczar (own work), 2007, via Wikimedia Commons, accessed January, 2013. Prince Georges County Government offices are located at 1471 Governor Oden Bowie Drive, Upper Marlboro MD 20772; phone: 301-952-4131. The land which we know today as Prince George's County was occupied for thousands of years before the first Europeans sailed to these shores. There is considerable evidence of Native American settlements along both the Patuxent and Potomac Rivers; hundreds of prehistoric sites indicate the presence of many villages and temporary camps in the centuries before the arrival of European colonists. The first recorded visit to Prince George's County by a European was in the summer of 1608, when Captain John Smith sailed up the Potomac River, probably as far as Great Falls. Two peoples inhabited the county in Smith's time: the peaceable Piscataways, whose villages ranged from the Anacostia River southward into Charles and St. Mary's Counties, and who were acknowledged to be the dominant tribe of the Western Shore; and the warlike Susquehannocks, who roamed and hunted in the northern part of the county, constantly pressing the Piscataways for more and more land. John Smith's visit in 1608 was an exploratory expedition only; no settlement was intended. Over the next 25 years, English traders paid frequent calls upon the natives here, sometimes to trade, sometimes to do battle. The most significant early contact came in 1634, just days after the first Maryland colonists landed near the mouth of the Potomac River. Advised by an English trader to meet with the Piscataways before establishing a settlement there, Governor Leonard Calvert sailed up the Potomac to the tribe's principal town, located on Piscataway Creek in the southern part of what was to become Prince George's County. Governor Calvert established good relations with the Piscataways, and after consultation he returned downriver to found St. Mary's City, Maryland's first settlement. The Maryland colony flourished at St. Mary's City and enjoyed peaceful relations with the neighboring tribes. Settlers soon left the confines of the original settlement. New counties were created, and within 30 years, farms and plantations lined both the Patuxent and Potomac Rivers well into the land that is called Prince George's County today. In the mid-seventeenth century, all of this land was included in Calvert and Charles Counties, established in 1654 and 1658, respectively; the land along the Patuxent was part of Calvert, while that along the Potomac was part of Charles. By 1695, sixteen or seventeen hundred people lived in this area, a number sufficient in the opinion of Governor Francis Nicholson to deserve the right of self-government. The General Assembly agreed, and on St. George's Day, April 23, 1696, a new county was established, named for Prince George of Denmark, husband of Princess Anne, heir to the throne of England. The first county seat was at Charles Town on the Patuxent, one of the port towns established in 1683 by the General Assembly. The new Prince George's County extended from the Charles County line on the south and all the way to the Pennsylvania border, and marked Maryland's western frontier. It remained the frontier county until 1748, when the westernmost regions were granted their own government, and Prince George's County's northern boundary became basically the line it is today. In 1692, four years before the establishment of Prince George's County, the Church of England became the established church of the Maryland colony through an Act of the General Assembly. By this time, ten counties had been established in the colony, and those counties were divided into 30 parishes. When Prince George's County came into being in 1696, two parishes had already been established within its boundaries: St. Paul's Parish in the area which had been part of Calvert County, and Piscataway (or King George's) Parish in the area which had been part of Charles County. At this time, there was already a church at Charles Town, the busy port town on the Patuxent that was to be Prince George's County's first county seat; this small church building was used as a meeting place for the new County Court until a new courthouse was completed in 1698. St. Paul's Parish also had a rural chapel for residents of the more remote regions, about 12 miles south of Charles Town. In Piscataway Parish, the first church was built in 1694, at the site of the present-day St. John's Church, Broad Creek. During the 1700s, the land of Prince George's County was gradually settled. Men and women from all parts of the British Isles, as well as other countries of Europe, came to find homes here. Some came as free men, others as indentured servants. By the beginning of the eighteenth century, landowners had turned to slave labor for the operation of their plantations, and large numbers of Africans were brought here as slaves to work. In 1706, the General Assembly of the Maryland colony passed an Act for the Advancement of Trade. This Act reestablished Charles Town, and also established five more port towns: Queen Anne, Nottingham and Mill Town on the Patuxent, Marlborough on the Western Branch of the Patuxent, and Aire at Broad Creek on the Potomac. A year later, a supplementary Act established the Town of Piscataway at the head of the Piscataway Creek. These trading centers grew; merchants built stores and sold everything from yard goods and shoe buckles to grubbing hoes, sugar and salt; lawyers and doctors established practices; innkeepers acquired licenses to sell liquor and opened their doors to travelers and residents alike. The town which had been established on the Western Branch (soon called "Upper" Marlborough in order to distinguish it from "Lower" Marlborough in Calvert County) developed more rapidly than the other towns established in 1706 and 1707. By 1718, Upper Marlborough had become such an active center that its inhabitants petitioned to have the court proceedings moved there from Charles Town. The General Assembly consented to the move, and the County Court met for the first time in Upper Marlborough in 1721. From this time until early in the twentieth century, Upper Marlboro (as it is now spelled) was the commercial, political and social center of Prince George's County, and it has remained the county seat to this day. In 1742, Bladensburg was established on the Eastern Branch of the Potomac, supplanting an earlier settlement known as Beall Town one-half mile upstream on the Northwest Branch. Bladensburg, together with Upper Marlborough, Nottingham, Aire at Broad Creek, Queen Anne and Piscataway, became an official tobacco inspection station in 1747 by Act of the General Assembly. Some iron was mined and worked in the Upper Patuxent region, and water-powered mills were constructed on the abundant water courses. Despite this growth, Prince George's County remained predominantly agricultural. Agriculture was the basis of the economy and directly or indirectly provided the livelihood for every resident. The crop that was the heart of this agricultural economy was tobacco. Tobacco created wealth for Prince George's County, wealth that built fine plantation homes like Belair and Compton Bassett, educated the children of the leading families, supported the work of religious institutions, and fostered the arts such as theater, dance and music that flourished in Upper Marlborough and other places. That wealth also provided the means to enjoy leisure time in activities such as fox hunting and horse racing, and enabled planters to devote such care to their horses and their breeding that Prince George's County became the cradle of American thoroughbred racing, a sport still very much a part of the county today. Tobacco provided modest livelihood for small farmers and even served as legal tender for debts. Tobacco also created a prosperous, sophisticated society which traded its staple with English and Scottish merchants for goods from all over the world. The earliest arteries of transportation had been the waterways, and they remained important avenues of commerce between port towns. But a network of roads had developed by the beginning of the eighteenth century, establishing overland connections between the several port towns and between the towns and the parish churches. As the population increased, as the political hundreds and the church parishes were divided for more efficient management, and as new plantations were established, more roads were cleared to allow easier communication between the population centers. Land and court records show the construction of new roadways; in 1739 a survey ordered by the justices of the County Court described a network of more than 50 roads connecting the towns of Upper Marlborough, Piscataway, Queen Anne, Nottingham, Mill Town, Aire, and Beall town, as well as the parish churches and their several rural chapels. Road building increased during the middle years of the eighteenth century; in 1762 another road survey indicated a significant increase in the miles of roadways. At strategic points along the major roads, and especially in the principal towns and river crossings, taverns were established; they catered to the needs of travelers and provided gathering places for the exchange of news and opinions. Revolutionary Period—Prince George's County was not untouched by the great tide of national events during those years. When the Revolution came, Prince Georgians organized county committees to assist the Revolutionary effort here at home, and they sent many of their sons to fight gallantly for the cause of independence. One of their fellow citizens, John Rogers of Upper Marlborough, sat in the Continental Congress, which in July 1776 voted to make the colonies free and independent states. In September 1787, Daniel Carroll, also of Upper Marlborough, was one of the 39 men who signed the newly framed Constitution for the United States. In April 1788, four distinguished Prince Georgians attended the Ratification Convention in Annapolis and voted unanimously in favor of ratifying the Constitution. In 1790, when the Congress in Philadelphia decided to locate the new federal capital somewhere along the Potomac River, Prince George's County ceded most of the land necessary to establish the District of Columbia. The ten-mile-square area was surveyed in 1791, and stone markers were erected during the following year at the four corners and at one-mile intervals along the lines. (Seventeen of these markers were located at the boundaries of Prince George's County; 14 of them survive.) Today, each of the great symbols of our three branches of government, the Capitol, the White House, and the Supreme Court building, stands on land that was once part of Prince George's County. The development of the Federal City was aided immeasurably by Benjamin Stoddert of Bladensburg, who acquired much of the land needed by the federal government from local landowners and later served as first Secretary of the Navy. After the Declaration of Rights in 1776, as American religion began an independent life of its own in the new nation, two Prince Georgians were chosen to assume roles of leadership. In 1783, the American Catholic Church formulated its first constitution, meeting at White Marsh, one of the oldest Catholic establishments in Maryland; and in 1789 John Carroll of Upper Marlborough became the first Roman Catholic bishop in the United States. In 1792 Thomas John Claggett, who had guided the formation of the Episcopal Church from its Anglican beginnings, became the first Episcopal bishop consecrated in this country. Prince George's County had been spared extensive military action during the Revolutionary War, but such was not to be the case in the War of 1812. In August 1814, the British sailed up the Patuxent to Benedict and began a march through the county, through Nottingham, Upper Marlborough, and Long Old Fields (now Forestville), all the way to Bladensburg, where they defeated an ill-prepared army of American defenders and marched on into Washington to burn the capital city. On their way back to their ships, they seized a Prince Georgian, Dr. William Beanes of Upper Marlborough, and took him with them to Baltimore. Francis Scott Key was on a mission to plead for Dr. Beanes' release when he witnessed the bombardment of Fort McHenry and wrote the poem which became our national anthem, "The Star Spangled Banner." Those early years of the nineteenth century brought changes to the county. Although tobacco remained predominant, farmers throughout the county began to experiment with new crops on land worn out by continuous cultivation of tobacco. In 1817, the first county agricultural society in Maryland was founded in Prince George's County, and agriculturalists such as Horace Capron, Dr. John Bayne, and Charles B. Calvert attracted national attention with their agricultural experimentation. The efforts of Charles Calvert brought about the establishment of the nation's first agricultural research college (now the University of Maryland at College Park), a further indication of the leadership of Prince George's County in that field. F.B. Morse strung the country's first telegraph line in 1844. The success of the Baltimore and Ohio Railroad also stimulated the planters of Southern Maryland to seek construction of another railroad through rural southeastern Prince George's County, to provide easy access to the Baltimore market. This goal was not realized, however, until after the Civil War. In politics, two sons of Prince George's County achieved national distinction in those early years of the nineteenth century. Gabriel Duvall of Marietta sat for many years on the United States Supreme Court, and William Wirt, a Bladensburg native, served for 12 years as Attorney General of the United States. In the course of the nineteenth century, five distinguished Prince Georgians served as governor of Maryland: Robert Bowie of Nottingham, Samuel Sprigg of Northampton, Joseph Kent of Rose Mount, Thomas G. Pratt of Upper Marlborough, and Oden Bowie of Fairview. Prince George's County then, as the nineteenth century passed its midpoint, was prosperous. Its agriculture was diversifying, some industry was developing, the fisheries of the Patuxent and Potomac yielded rich harvests, steamboats plied the Patuxent linking the county to Baltimore, trains ran regularly on the line between Baltimore and Washington, and above all, the growth of the staple crop, tobacco, remained a profitable enterprise. In fact, more tobacco was grown here than in any other county in Maryland, and more slaves tilled the fields here than in any other place in the state. The labor of the county's black community, 90 percent of it enslaved in 1860, helped guarantee that prosperity. But the old tobacco society was to end, because forces beyond the control of any Prince Georgian would soon plunge the nation into a bitter Civil War. Prince George's County, like the State of Maryland and the nation, was divided during the monumental struggle from 1861 to 1865. Although Maryland made no move to secede from the Union, there was great sympathy in the county for those states that did. The county had a plantation economy and a population in 1860 that was more than half slave. The prominent families of Prince George's County were slaveholders, and a significant number of their sons went south to fight for the Confederacy. When the institution of slavery was abolished in the District of Columbia in 1862, many of the slaves of Prince George's County fled to freedom there. Emancipation took effect in Maryland in January 1865 and brought an end to the old plantation system. When the war ended three months later, the old Prince George's County was gone, and the county began a second life. After the Civil War—The Civil War brought significant changes to Prince George's County; some were immediately noticeable, such as the freeing of the slaves. Small communities of blacks began to develop soon after the cessation of hostilities, such as Rossville near the Muirkirk Furnace, Chapel Hill near Fort Washington, and the black communities near the towns of Woodville, Queen Anne, and Upper Marlborough. Each of these communities was centered around a place of worship, usually Methodist. The newly emancipated people proceeded to build their homes while supporting themselves working in the iron furnaces or in railroad construction, and principally in farming. With the assistance of the Freedmen's Bureau, these communities soon had schoolhouses and teachers, beginning the significant movement toward black education. A substantial number of blacks moved out of Prince George's County during the generation after the Civil War, especially into the District of Columbia. There were also changes in the county's economy. Agriculture remained the predominant way of life, tobacco continued to be the most important crop, and the large plantations by no means vanished; but in the last decades of the nineteenth century, small farms growing tobacco and other crops played a larger role in the county's economic life. Between the end of the Civil War and the turn of the twentieth century, the number of farms in Prince George's County doubled, while the average farm size decreased dramatically. Many of these new smaller farms were operated by freed blacks, and many others were owned by newcomers to the county. As the agricultural population grew, so did commercial life and the importance of local commerce in the overall economic picture. But this second life of Prince George's County, of small farms and local commerce, soon gave way to a force that would affect this county as profoundly as tobacco had in the old days. That force was the growing federal government and its expanding Capital City. As Washington grew from a small town to a major capital, it began to spill over into the adjoining communities. A new phenomenon, the residential suburb, began to develop in order to accommodate the increasing number of federal employees and city workers. The new branch line of the Baltimore and Potomac Railroad had opened in 1872. It joined with the main line to Southern Maryland at the Bowie junction and created a second rail link between Washington and Baltimore. Speculators were quick to see opportunities for new residential development. In the 1880s and 1890s, more and more residential communities were developed north of Washington along both of the railroad lines, offering federal employees the opportunity to live away from the city in healthful surroundings easily accessible by rail. In towns like Hyattsville, Riverdale Park, Berwyn Heights, College Park, Glenn Dale, and Bowie, fine Victorian dwellings of the 1880s and 1890s still give evidence of this booming period of suburban expansion. As the nineteenth century drew to a close, the county's population was 30,000, 30 percent higher than it had been in 1860. As the twentieth century began, the national capital continued to spread into Prince George's County. New types of transportation, like the streetcar and the Washington, Baltimore and Annapolis electric railroad, offered yet more opportunities for residential development along the borders of the Federal City. Towns like Mount Rainier, Colmar Manor, Cottage City, Brentwood, Capitol Heights, and Seat Pleasant began to develop during the first decade of the new century. Several black communities—North Brentwood, Fairmount Heights, and Lincoln—were established and attracted members of a growing group of black professionals from Washington. The new science of aviation made history in Prince George's County with the establishment of College Park Airport in 1909 and with military flight instruction there by Wilbur Wright. In 1941, John Greene established the Columbia Air Center, the first black-owned airport in the county, on a field near Croom. The county's prominence in the science of aviation was reinforced by the construction in 1942 of the new military airfield known today as Andrews Air Force Base. Other large federal installations had moved into Prince George's County during the first half of the century: Beltsville Agricultural Research Center, the huge (over 10,000 acres) agricultural area purchased by the U.S. government between 1910 and 1940; Patuxent Wildlife Research Center established in 1936; and the Suitland Federal Center complex established in 1942. Then in the late 1950s, the National Aeronautics and Space Administration established its primary science center (Goddard Space Flight Center) in Greenbelt. These important government installations exerted a significant influence on the employment patterns of county residents and became a major factor in the more than ten-fold population growth of the county between 1930 and 1970. Farming remained the way of life for many in the vast rural areas beyond these new towns, but year by year the percentage of the population earning their livelihood through agriculture declined as the denser suburban population close to Washington grew. New communities also began to appear as the increasing use of the automobile allowed for further residential development, in some cases at a distance from railroad and trolley lines; Cheverly, Greenbelt, District Heights, New Carrollton, and Glenarden are examples of this trend. Prince George's had been a county of 30,000 persons in 1900; it became a county of 60,000 in 1930, and by 1950 had increased to almost 200,000. In the mid-1960s, the construction of the Capital Beltway defined the boundary between urban and suburban/rural Prince George's County, and the suburbs continued to expand and spread. By 1970 the county's population had reached 660,000, and less than a third of its population lived outside the Beltway. A sewer moratorium and a large drop in average household size combined to slow the population explosion during the 1970s, so that the population increased only to 665,000 in 1980. The pace of residential development, particularly an increase in the number of single-family homes, picked up after 1980 and continued through 2000; most of these new single-family houses were built outside the Beltway. By the year 2000, when the population reached 800,000, over half the county's population lived outside the Beltway. Many changes have come to Prince George's County during the 300 years since it was established. Once a rough and challenging frontier land with small groups of settlers pursuing commerce and agriculture, the county developed during the eighteenth and nineteenth centuries into a prosperous, sophisticated tobacco society. When that society met its end in war, small farms growing tobacco and other crops and local commerce became the dominant ways of life, until Prince George's County finally became part of the expanding metropolitan area of Washington, D.C., and now is a place where men and women of all creeds, religions, races, national origins, and economic positions live and work. But despite these great changes, reminders of the past are all around us, sometimes hidden from sight and sometimes unrecognizable to the newcomer. Although most of its citizens live in an urban setting today, much of the land still retains its rural character, and agriculture is still the way of life for some. If Prince Georgians of today head out of the city, beyond the Beltway and suburban developments into the large areas that are still country, they can walk into the woods or along the creeks and rivers and see, if just for a moment, a Prince George's County that the first settlers might have seen more than 300 years ago.